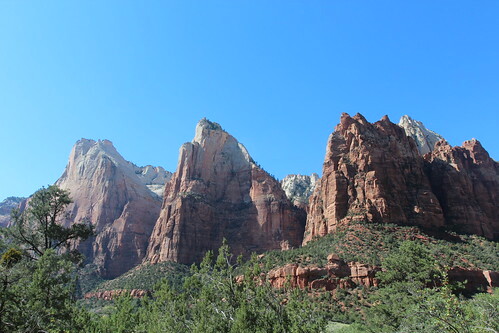 Mali Mish – Day 48: Zion National Park, Utah. 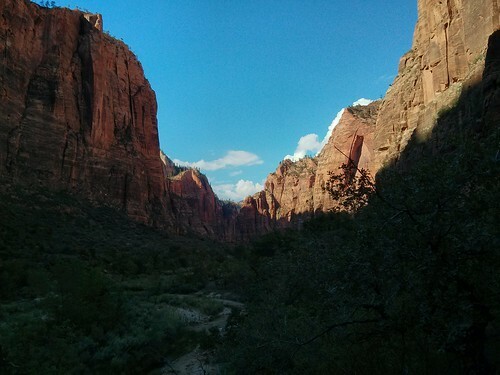 Zion is a quick drive from Cedar City, Utah where we spent the night at the Walmart. It’s the same place we stayed last time in July 2012 at the beginning of our cross country trip. This time we were here in September so the weather is still warm. But it is tolerable. September is the tail end of the high summer travel season for a lot of families. We knew that getting a reservation would not be easy so we had not planned to stay here. It turns out, it would be even harder to find a place to park the van and trailer. We circled the jam-packed parking lot several times before giving up and heading over to South Campground. Since South Campground is first-come-first-served and has no hookups, our chances were much better here than Watchmen Campground next door. To our surprise, we easily found a large site and paid the $16 for the night. We do not plan on staying the night here but it was a good option to have a safe place to park the trailer during our visit. 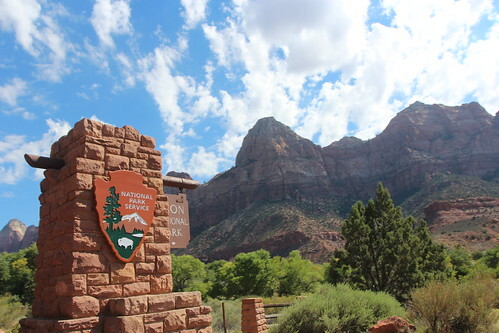 Since this is such a popular national park, and one of the closest to Las Vegas so it naturally attract lots of visitors, Zion has it’s own shuttle buses that take visitors around so they don’t have to drive on the 2 lane road throughout the park. This regions has had a human presence since as long as 8,000 years ago. For the first 6,000 years, people only hunted and gathered. Evidence of corn being planted here appeared about 2,000 year ago. It wasn’t until the late 18th century that the westerners began exploring and settling in this area. It was originally named as Mukuntuweap National Monument by President Taft in 1909. That name was changed 9 years later by the acting director of the National Park Service to Zion in fear that an native name would deter visitors. 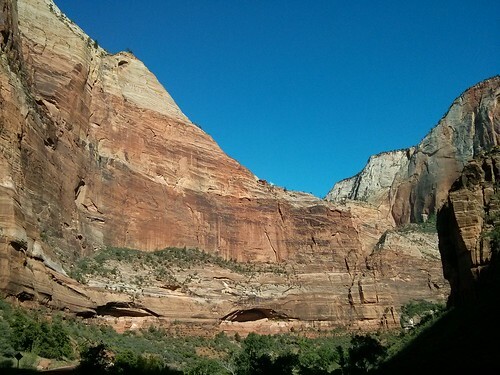 Unlike the Grand Canyon, the main route in Zion by car takes you through the bottom of the valley. It gives you a different perspective of this landscape from below. There are several trails that can take you to the top for a view but our little ones are not yet up to that task. 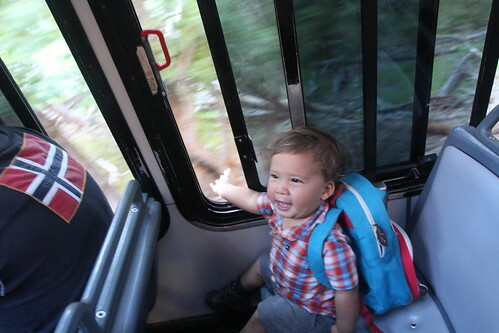 Along the shuttle route, you are free to go off and back on as you wish. We picked several spots to explore and admire this amazing place. 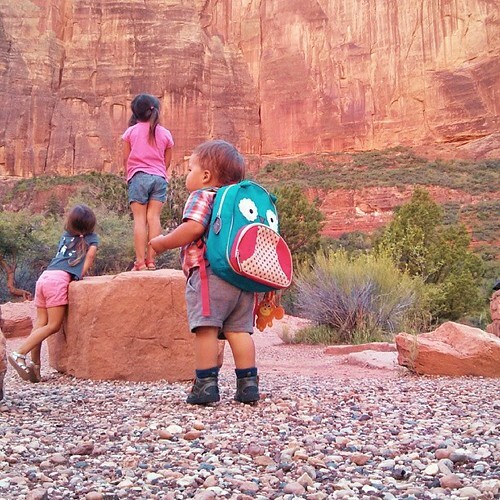 Luka insisted on wearing his sister’s backpack during our excursion through Zion today even though it threw him off balance. “Bapa!! !” he screamed… to everyone who would listen. 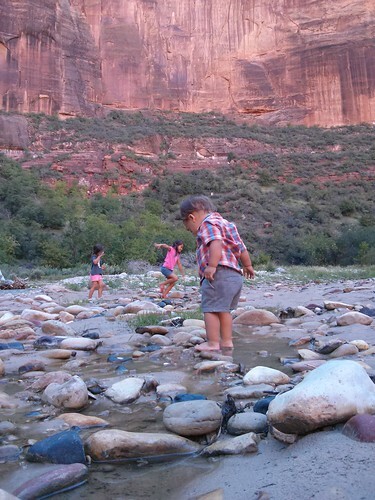 We hiked down a small trail at the bottom of Angel’s Landing and got our feet wet in the Virgin River. 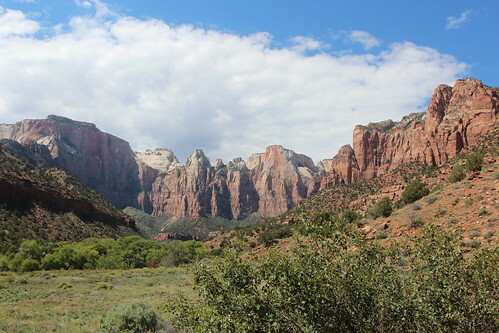 Zion is a place worthy of spending several days at but most of it would involve hiking. We are definitely coming back in a couple of years when the girls are more accomplished hikers. 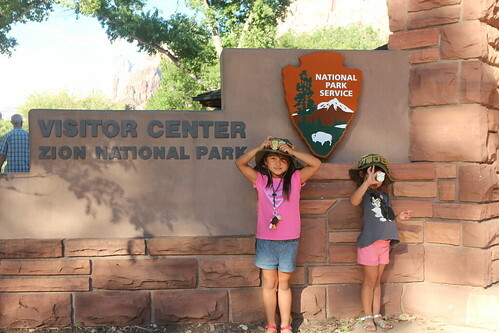 They did earn their Zion National Park Junior Ranger badge today which almost completes our Utah collection. We just have Canyonlands left as a park and a couple of other monuments in the state. 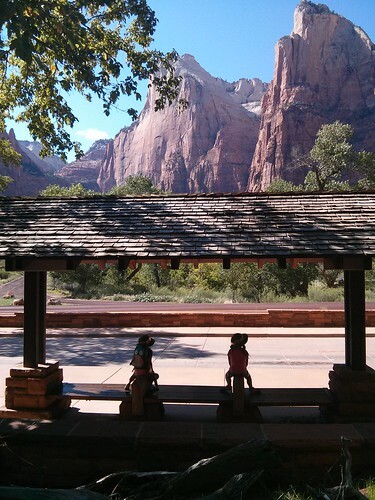 It is hard to tell in these photos how crowded Zion is in September but we were glad to be able to fit it in. 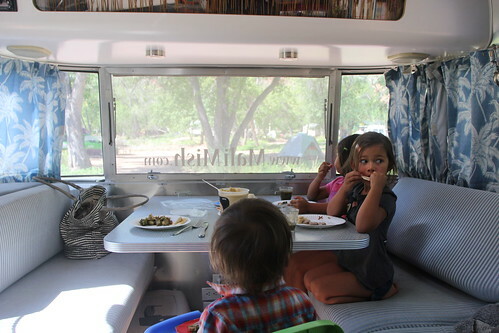 We will stay at our campsite until after dinner and make our way over to Las Vegas and stay for a couple of days. Just one more stop before we officially close this loop of our travels back in Southern California. 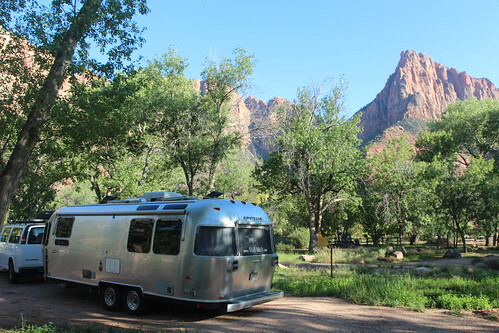 One Response to Day 48: Zion National Park, Utah. 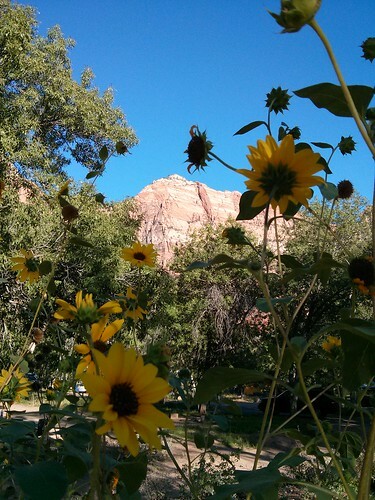 We adore southern Utah and Zion in particular. In 2003 we took a road trip to Zion for our honeymoon and had such a great time. We only hiked the Narrows and Angels Landing so we’d definitely like to go back there someday. I remember how crowded it can be, too!